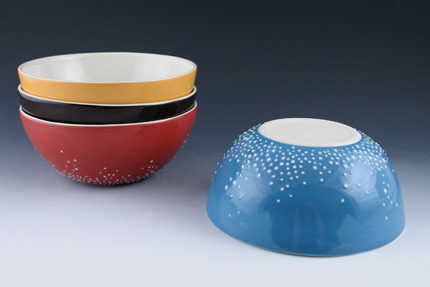 Pebble Bowls in Blue, Red, Chocolate and Orange. Hand-thrown porcelain bowls accented with a beautiful pebble inspired slip design in white over a hand painted exterior. The design is comprised of individually applied slip dots which are slightly raised above the surface. This gives the bowls a nice, tactile quality. Covered inside and out with a food safe, glossy clear glaze. Measures approximately 6.25"W x 2.5"H and holds about 2 cups. Dishwasher safe. for wholesale, retail or press inquiries, please send an email to: studio@kimwestad.com. copyright kim westad, 2007-2009. Reproductions of work or images is prohibited without consent.